We have a long history of working with composites, and the current constructions in our lineup reflect many years of pressing, shaping and thrashing. It’s safe to say the our X-Flex and X-Tuff Composite constructions are among the strongest, most impact-resistant decks you can buy. 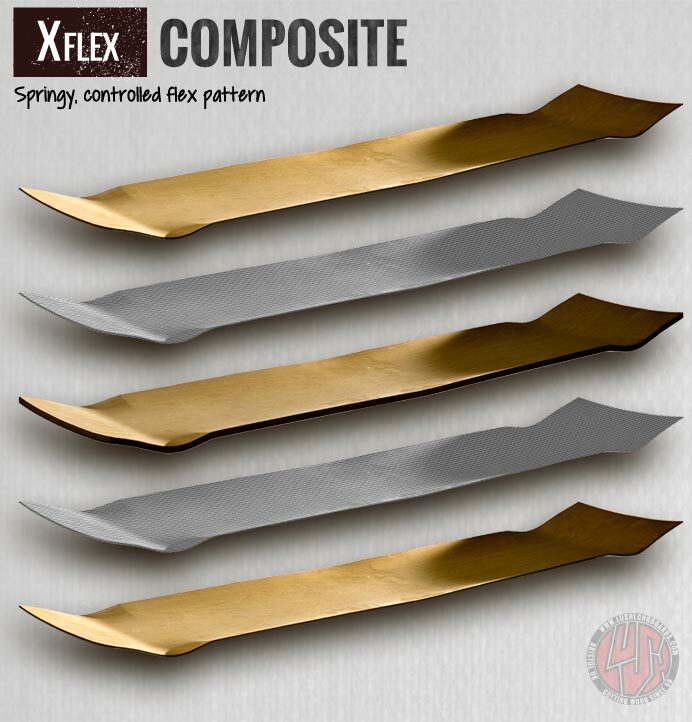 For lively, flexy, pumpy decks with a controlled spring, choose X-Flex. 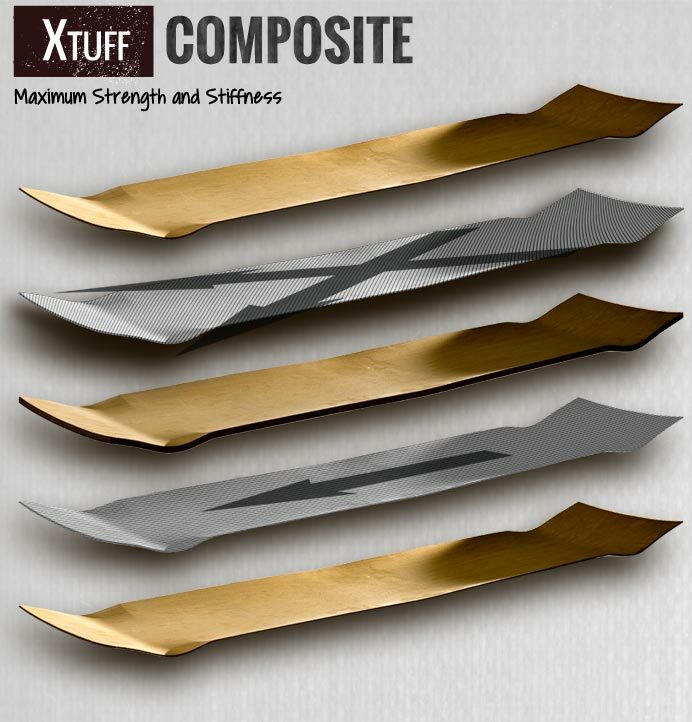 For race-ready stiffness and strength, choose X Tuff Composite. To create a lively, but controlled (damped), flex. To create a layup that is strong enough to withstand the abuse of modern day riding. To do both of these things at a price you can afford. We used a mixture of Canadian Maple and 600gsm Bi-Axial fibreglass. The clever bit is how we’ve used it – to understand what we’ve done, you’ll need to understand how a regular glass layup works. Fibreglass has exceptonal tensile strength – it’s strongest when you try to stretch it (“Extension”). It can withstand a good deal of Compression – but it’s strongest when it’s being pulled. Here, the Outer Layers of Fibreglass are acting together with the Wood Core to create an “I Beam” structure – a very strong shape for it’s weight, and ideal for making skateboard decks. With X-Flex, we’ve added two layers of Maple to the outside of the tried and tested “I-Beam” structure. The further away from the middle of the deck you get, the more the veneers stretch or compress as you bounce up and down on the deck. 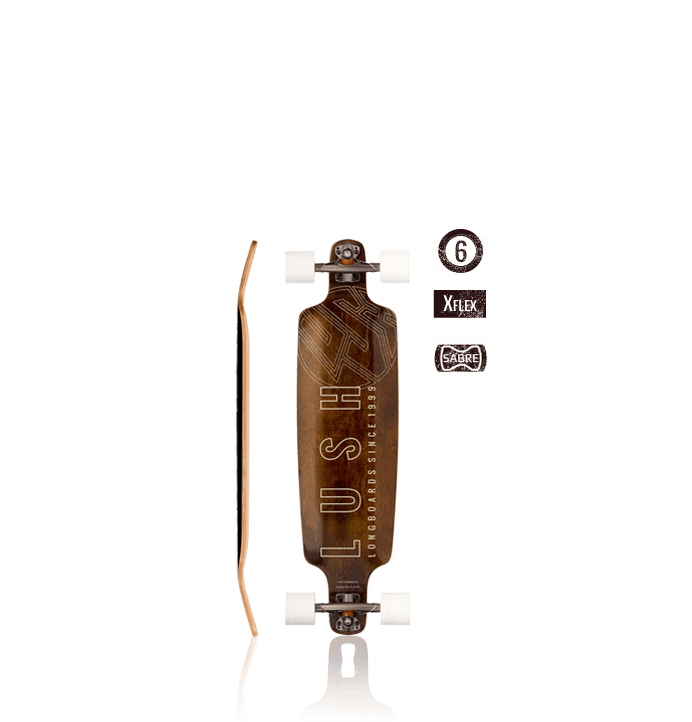 Flexy longboard decks are essentially “Leaf spring” suspension systems. And every good suspension engineer will tell you that, whilst your main spring does the initial impact absorption, without damping to dissipate some of the shock, you will have a wild and uncontrolled ride – simply put, it’ll be too bouncy. The same applies to skateboards – you don’t want a trampoline under your feet. The result? A fluid, controlled flex, which has a good deal of bounce and will hold it’s shape for a long time, without feeling too much like a trampoline. The Outer Maple Layers also provide a bit of ablative protection – no more fibreglass splinters every time you kerb your board. Extra stiffness lengthways, but with just enough flex to absorb bumps and keep a smooth ride. Controlled, directional flex is key. Goal #1 – Minimise Torsional Flex. 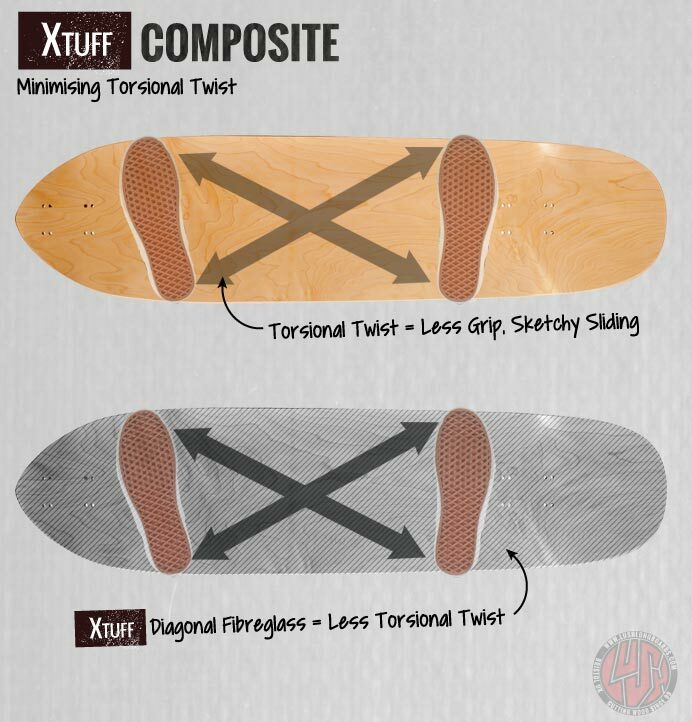 On the right you can see what we mean by torsional flex in a longboard. As you turn side to side, your toes and heels “twist” the board along it’s length. 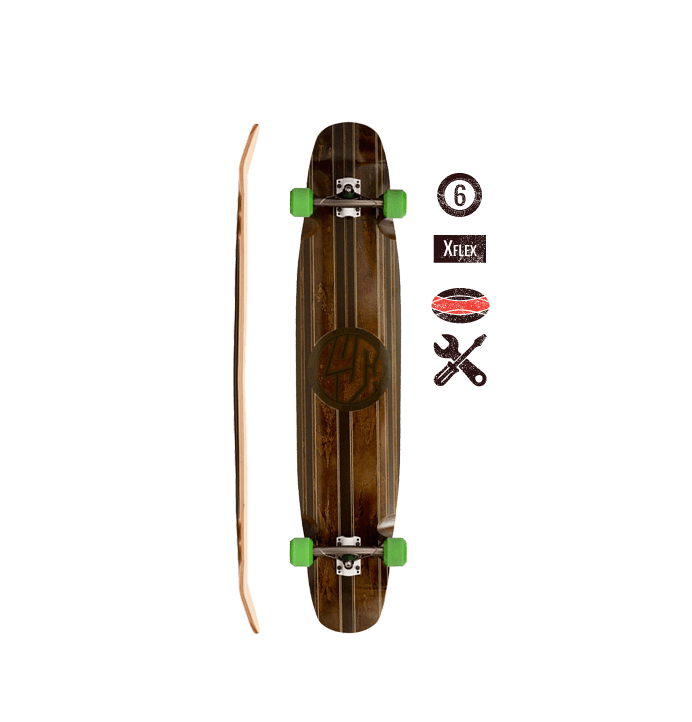 Whilst this can be desirable in a cruiser deck, in a speedboard it gives sloppy cornering and unpredictable sliding. Not cool!! You can see that the lines of force run diagonally across the deck, from shoulder to shoulder, or heel to toe. With X-Tuff, the uppermost layer of glass in the deck runs diagonally, so that the fibres act to prevent the deck twisting as you corner and lean. However, we don’t just want torsional stiffness, we also want a degree of lengthways stiffening too, as speedboards need to be stiff to a predictable ride. In short, we need to control the flex according to it’s direction within the deck – we want zero twist, but a tiny bit of give along the length to absorb any bumps and shocks. To do this, we’ve kept the bottom layer with the fibres running along the length of the deck to give us extra stiffness lengthways, and we’re using the top diagonal layer to minimise torsional flex. So what this means is – you get your torsional stiffness from the top layer of Fibreglass, and your lengthways stiffness from the bottom layer of Fibreglass. We’re using the same Outer Maple Veneers as X-Flex to damp things down and give a controlled ride with minimal bounce. We generally use a thicker Wood Core for X-Tuff, matching thickness with wheelbase to maintain the balance between high stiffness and light weight. 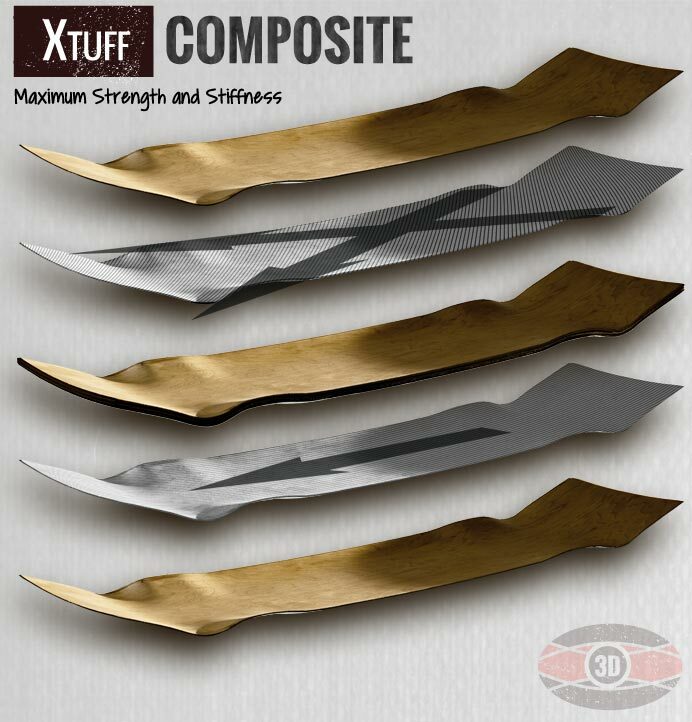 X-Tuff is proven in te toughest race and freeride conditions all over the globe. Our riders can attest that it is one of the strongest and most effective speedboard constructions available, anywhere.